MAVIM Latur (Mahila Arthik Vikas Mahamandal Latur), Latur published a new job notification for Area Coordinator & Associate Posts. The recruitment is for total 08 Vacancies. The willing candidates are informed to see the latest notification March 2019. Qualification required Graduate with MS-CIT and More. Last Date of offline application is 22-03-2019. For more details of MAVIM Latur Recruitment 2019 Read Below. Area Coordinator is 21 to 45 Years. Associate is 21 to 40 Years. Interested & Eligible candidates can send their application along with all the necessary documents and testimonials to महिला आर्थिक विकास महामंडळ (माविम) त्रिमूर्ती भवन, दुसरा मजला, बँक ऑफ इंडिया वर, उदय पेट्रोल पंपाच्या जवळ, बार्शी रोड, लातूर-४१३५३१. Application starts offline 09-03-2019. 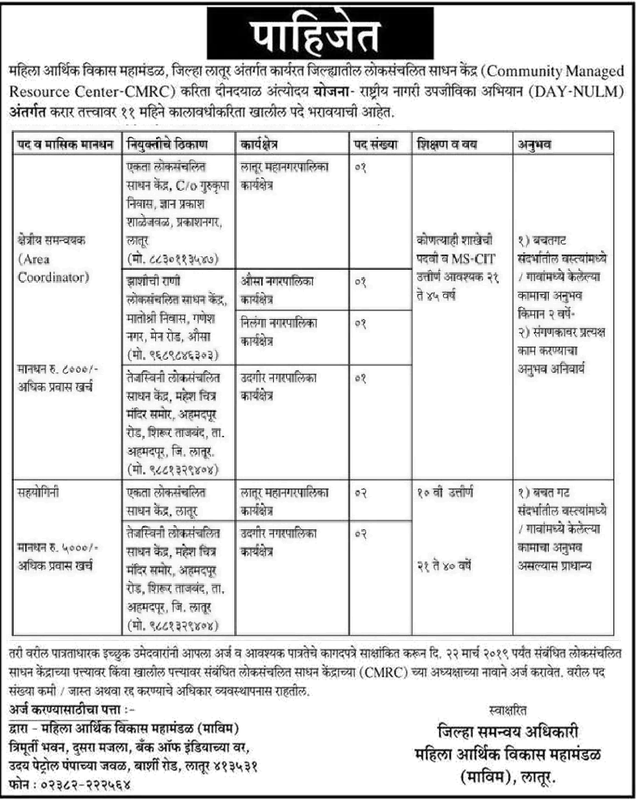 Last Date of application is 22-03-2019.